All-new Costa Pacific Rise 100 prescription glasses perfectly balance fashion and function. 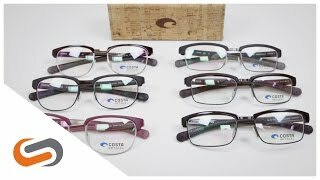 These Costa prescription glasses feature a proprietary bio-based nylon resin frame construction that is complimented with a partial titanium frame design, showcasing pure aesthetic. Hydrolite rubber temples provide classic designs with an incredible comfortable fit. Count on a pair of Costa Pacific Rise 100 prescription glasses to fulfill all your style, comfort, and sight needs.